I grew up in North Carolina. But me being an UNC basketball fan was not a given. My dad got his undergraduate degree from Wake Forest and he taught physical therapy at Duke University and did a year of pre-veterinary schools studies at North Carolina State University. My mom studied medical technology at Duke University, which is where she and my dad met and made their lifelong commitment to each other. So my dad always pulled for Wake Forest, NC State, or Duke, and my mom always pulled for Duke. But I was a UNC basketball fan from my earliest memory (I also got my undergraduate degree in the UNC system). Perhaps, initially, it was simply to establish my independence from my parents. That’s how I made a lot of decisions in those days, but there was serious thinking behind my quest to be independent. From an early age, I determined that I was not going to to follow the crowd and do – or like – something just because everyone else was doing – or liked – it. I had to have good, solid, objective, and defensible reasons for my choices. That has not changed. I know, though, that Coach Smith was the deciding factor, even though I didn’t realize why at that early age, in which of the ACC-backbone colleges, that North Carolina had an abundance of in the 1970s and 1980s, I would follow. This was back in the days when the Atlantic Coast Conference (ACC) was geographically-based, not the current configuration of interlopers from all over the country that most of us who grew up with the original ACC don’t consider to really be part of the conference (it’s all about money now, something else that has changed about college sports since my younger years). It was also the original ACC that had a lot of flamboyant and temperamental coaches, including Lefty Driesell at the University of Maryland and Jimmy Valvano at North Carolina State University. Their emotional outbursts, accompanied by chair-throwing and screaming and violent gesturing at everybody, including the officials, often made the headlines more than their coaching (Valvano, it turns out was a softie underneath all those theatrics, and I’ve grown to appreciate his more subdued and valiant battle with cancer and his philanthropy that has continued since his death). Coach Smith stood out for me because he exercised a lot of self-control and he treated everybody associated with the game with respect and with dignity, even in the face of losses and defeats. That is one of the hallmark features of a quintessential leader. Coach Smith had many other quintessential leader traits that stand out in stark contrast to most of his colleagues, then and now. First, Coach Smith built teams instead of simply depending on a superstar with talent. He preached teamwork, he fostered teamwork, and he provided an environment, both on the court and off the court, where teamwork thrived. Some seasons he had little raw talent in the recruiting class, but he maximized the assets of each player to build winning teams. Other seasons, he had lots of raw talent in the recruiting class, but he incorporated that talent into a team design. A vivid example of this is the 1982 UNC team that won the NCAA championship. 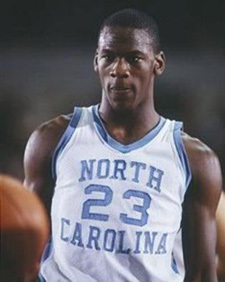 The North Carolina team included recognizable names like Michael Jordan, James Worthy, Sam Perkins, Buzz Peterson, and Matt Doherty. UNC played Georgetown in the NCAA championship game. 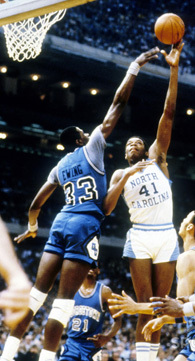 Georgetown had a single player whose talent it hinged its entire season on: Patrick Ewing. This game ended up being Patrick Ewing playing against the entire team that Coach Smith had built. 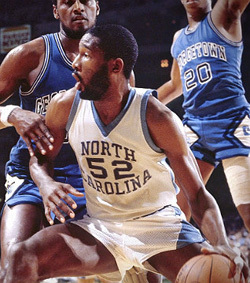 Although the talents of Jordan, Worthy, and Perkins especially, were evident in this game, there was no doubt it was a team effort that won the game, especially with Coach Smith’s signature Four Corners play, which depended on all five players on the court contributing to make it successful. 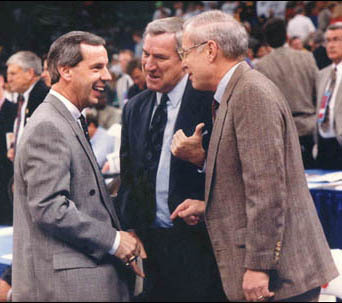 Second, Coach Smith worked to develop quintessential leaders both in his players and in his coaching staff. The principles that he modeled and constantly taught them were life principles, built within a framework of respect, living up to a higher standard of conduct and principles, and always looking toward growth in character and in achievements. While not all of Coach Smith’s players and coaches internalized or practice what he taught them, most did and they have passed it on or are passing it on to future generations, as coaches, as leaders, as parents. Examples of this quintessential leader modeling and teaching abound. 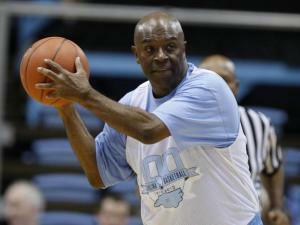 Current assistant UNC coach Phil Ford still has his watch set ten minutes fast, just as he did back in the 1970’s as a UNC player to ensure that he was never late for practices, games, and team activities. Another principle that Coach Smith taught and modeled was to acknowledge everyone for their participation in the success of the team. Coach Smith accomplished this in several ways. The first was the well-known UNC basketball tradition of players pointing at other players who assisted them in successful plays. 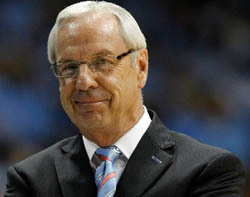 UNC Coaches Bill Guthridge and Roy Williams, both of whom served as coaching assistants under Dean Smith, continued and continue to teach this principle. The other way that Coach Smith did this – and subsequent coaches with the exception of the short-but-disastrous coaching tenure of Matt Doherty have done and do – was making sure that eventually every player on the bench got to play in a game. Coach Smith did this consistently in games where one team, even if it wasn’t UNC, had an insurmountable lead and the win or loss was already in the books. Even in the worst of losses, Coach Smith would bring all the career bench-warmers in to play for a few minutes, to give them recognition as being a vital part of the team. Additionally, each year, all the players who were seniors, even if they had never played in a game in their college career, got to play in a few minutes in the final UNC game of the season. What Coach Smith taught by doing this was that these players, who are the heart and soul of team development during practices, were just as valuable and had made, although it was unseen by the crowds watching the games, an invaluable contribution to the success of the team as a whole. Another quintessential leadership principle that Coach Smith modeled and taught his assistant coaches and players was that the bonds they were forging were lifetime bonds and everyone had an obligation to honor those bonds and help each other out as needed for the rest of their lives. He taught selflessness and service, not selfishness and being served. He modeled that as long as he was physically and mentally able all his life. Coach Smith modeled and taught another quintessential leadership principle by encouraging his team of coaches and players to grow and improve themselves for the rest lives, not resting on their laurels or on a stagnant single moment in time where they may have excelled at one thing. He preached education and he pushed his teams to not only succeed academically as college undergraduates, but to continue their education to ensure their continuing success no matter where life took them after UNC basketball. A final – there are too many to cover in this space – quintessential leadership trait that Coach Smith had and taught was one that I’ve already alluded to and that is self-control no matter what the circumstances. As far as successive head coaches for UNC go, I think Bill Guthridge (who is suffering from vascular dementia), who became head coach after Coach Smith’s retirement in 1997, did the best job of continuing this modeling and teaching. Coach Williams does it most of the time, but he’s been known to throw a chair or two in his tenure as North Carolina’s head coach (Matt Doherty was not the model for anything, including self-control, while he was head coach of UNC – I think he was unprepared and he forgot the lesson of humility, and once that was gone, everything else followed). It didn’t mean that Coach Smith was not firm and didn’t take corrective action when it was necessary, but he never lost control of his emotions or his words, on the court or off the court. That is the epitome of self-control, especially in a career, where swearing was and is the norm for coaches and players at the collegiate (and now, even younger) level. As I said before, Coach Smith was not a perfect man and he was not a perfect quintessential leader. But none of us are perfect people or perfect quintessential leaders either. Yet, like our goal and what we are striving to be, it’s clear that Dean Smith’s goal and what he strived for all his life was quintessential leadership. In the balance, I think he did a pretty good job overall. The question for us, then, is when our lives are weighed in the balance after our deaths, will the same thing be said of us? How and what are we doing right now toward making that a reality? 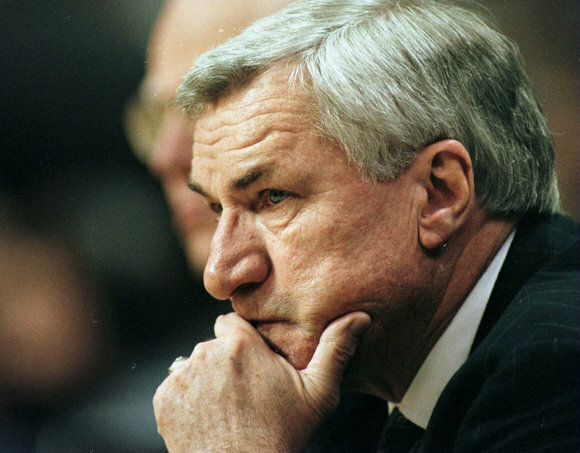 Coach Dean Smith had dementia the last several years of his life and as he made the inevitable slide into deep cognitive impairment, there were very few of his players and coaches that he remembered during the last couple of years. 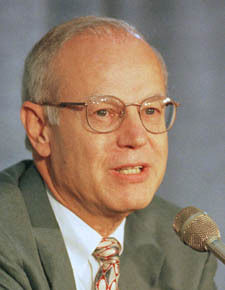 One occasional exception was Bill Guthridge, his long-time assistant coach who became head coach after Coach Smith’s retirement. Bill Guthridge, it has recently been revealed, is going through the journey of vascular dementia. This was my tribute to Coach Smith on my leadership blog and it deserves a place here as well because of his journey with dementia.